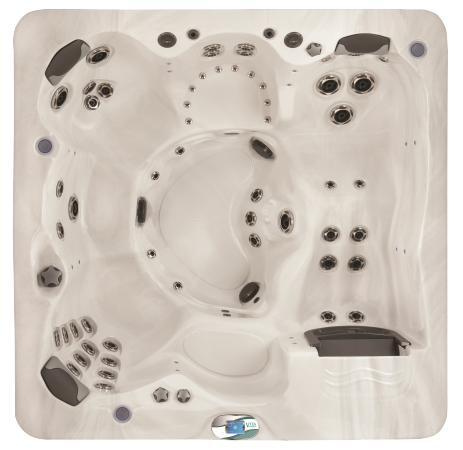 The Vita Spa Chateau is the entry level hot tub in the luxury 700 series range from Vita Spas. The Chateau is designed to deliver space and power, maxium hydration in maximum comfort so that you get a really big tub that can seat 5 adults including one full lounge seat, plenty of space and plenty of enoyment. Where the number of seats come secondary to enjoyment and relaxaion and you have the space for a big 5 seat hot tub, the Chateau is a great choice. Being in the 700 series range, you also benefit from a long list of luxury features thart offer comfrot as well as efficieny to save you money. From the Biozone water management system to the HEET 24 hour circulation pump, every lelement of this luxury 5 person hot tub is designed to offer efficiency, ease of use and management along with luxury. There are 71 jets in totoal including 10 air jets, fountains and cascading water features that sit along side LED lit cup holders and a great under water lighting system. Bay Spas can supply and fit this fantastic luxury 5 person hot tub anywhere in the south west including Devon and Cornwall.